Are you like King Midas with a penchant for all things gold? Well, if you find the real thing to be out of your reach, how about settling for a fake to satisfy that lust for riches? 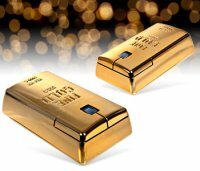 The Gold Bullion Wireless Mouse sounds (and looks) the part, offering a wire-free pointing peripheral while giving you that accomplished feeling at work. This particular brick is now wireless and looks satisfyingly like a huge hunk of gold bullion. Whether you’re scanning plummeting share prices on-line or looking for a cheap washing machine on e-bay, this high tech wireless mouse will enrich your experience. You can charge it by plugging it into a USB port, so you don’t have yet another gadget needing batteries. It’s a great big bling thing! One thing’s for sure though – this doesn’t look too ergonomic on your hands, but you surely can’t argue with the £24.99 price point.